Fury’s proficient boxing skills should’ve earned the victory, while Wilder’s power was his saving grace that grabbed the draw. Last night’s Fury vs. Wilder fight was like a clash from the classic exhilarating days of heavyweight boxing. The thunderous blood-pumping adrenaline that whammed and thrummed throughout the rip-roaring crowd. The sheer electricity and enthralment that speared through the arena like lightning bolts as the two heavyweight giants danced, jabbed and salted one-another with steely shots for twelve wonderful rounds of professional boxing. From the announcement back in August, throughout the build-up to the fight itself; this match had everything all classic bouts should possess. The story of a lineal champion struggling with issues relating to mental health and a return to the sport that defied the odds. Fury was the underdog in this fight, with nearly three years on the couch and a 250lb ballooning. Not many envisioned he could actually present as a worthy opponent and possibly beat the wrecking-ball knockout merchant that is, WBC heavyweight champion, Wilder. Pugilsitc intelligence vs. raw, brutal strength – what or who prevails? A clear example of the sweet science against power and barbaric scrapping. 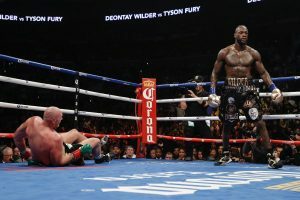 The lineal heavyweight champion proved he’s still the slick and hybrid-style boxer he always was, as he schooled the champ for ten of the twelve rounds, despite opinions that Wilder would blast him out of the square jungle by round 6. After having his face speared with solid jabs, Wilder puts Fury on the canvass with a beefy right in round 9 and briefly unconscious in 12 with a monsterous right and brass-knuckled left. Fury, clearly ahead on points until a chilling five second knockout in 12, somehow manages to hurl himself to his feet before dishing out some more thudding jabs and a further schooling to Deontay Wilder. The final bell clangs and a split decision is the call without too much complaining from both fighting men. A respectful embrace closes the bout as the boxing world salivates with the juicy prospect of yet another thrilling fight between Tyson ‘the gypsy king’ Fury and Deontay ‘the bronze bomber wilder’. Here’s to the REMATCH in 2019.